I recently received an email press release that features a compelling design with strong visuals and a nice layout. That’s not something you say every day, and since bad releases get called out much more than the good ones, I thought I’d share it here. 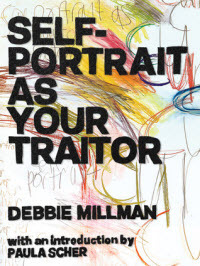 It’s for a new book of visual essays and poems by Debbie Millman, Self-Portrait as Your Traitor. With that kind of content it makes sense for the press release to have compelling visuals too, and I think they pulled it off well. Props to Jennifer Abel Kovitz and 45th Parallel Communications for putting together an engaging press release that is well suited to the material. There is also a companion press kit with more information. We’ve come a long way since email press releases circa 1999. Seems OK, but all those graphic design elements in the e-mail would not have appeared in any Inbox configured to display HTML messages as plain text. Many journalists use that default setting to protect themselves from invisible Web (tracking) bugs embedded in HTML e-mails. While this sort of e-mail pitch may be successful with arts-industry trade journals & sites, as a former AP and Seattle Times editor I find it way too visually distracting, and the overuse of boldface is a turn-off. (Nothing’s special if everything is special.) As a PR writer, I also find the run-on sentence constituting the entire second graf of the author’s bio in this e-mail a mark of substandard professionalism. I would imagine that major-outlet journalists (even book reviewers) would prefer just the facts, ma’am: A pithy, concise e-mail with two grafs explaining why the recipient should find the book interesting/worth reviewing. The otherwise text-only pitch should include a link to a landing page for the book with full details (some of which are presented in the e-mail you’re showing us), residing in a well-stocked online press center with everything in it a journalist could possibly want about the book, its author, its publisher, and its reception. All good points Steven. I like the overall look and think it is well suited to the material, but if sticking with plain, short and simple gets the most traction, it’s hard to argue with that. I see what you’re saying about the wide-scale use of bold too. It would be interesting to do some A/B testing of plain text and HTML emails. I also like the idea of a simple email with a link to a more robust landing page. Perhaps we’ll be able to get some additional information from Jennifer Abel Kovitz on the choices they made and how releases like this tend to perform for them. Have to agree with Steven and would go farther and say it’s awful. It’s far too busy so it is impossible to scan it quickly to find the news. Like Steven I’d never see the graphics as Outlook by default doesn’t show them – and I can only see disadvantages in changing the defaults to show them automatically. I’ve also just shown your post to a couple of regional newspaper journalists in the UK and both agree they’d prefer a simple text based news release. Just to check that it wasn’t different for ‘arts’ journalists one of them was the arts editor of one of the UK’s biggest regional newspapers. His response was “I want plain text email and a link to look at this lovely one online’. Thanks for your input Stuart, and for sharing this with a couple of journalists. That’s good feedback. I’ll stand by my praise of the overall look of this release, and I do think it’s a nice match for this particular book. But I acknowledge that a simple email announcement linking to a more robust landing page is likely the safer and more effective approach. Essentially the best of both worlds. Also my main intention was to call attention to the nice use of visual elements and color, basically the overall design. I wasn’t commenting on the specific language used within the release. I agree with Steven’s point about over-use of bold, and I think it would be possible to use a similar design with text being more of a simple, key points approach. Re: graphics in an email, I use Outlook too and get lots of press releases, newsletters and other business correspondence with graphics in them. When I want to see the visuals for a particular email, I just click the “download pictures” link at the top of the email – my choice, when I am sufficiently compelled and feel comfortable with the sender. So for me it’s not a significant barrier. But I agree that you want to maximize the likelihood of all of your intended recipients actually viewing the information. I agree that most journalists would not like this creative style of press release, however I think it could be very effective to a different audience. Like a press release it hold essential information and facts about Millman. I believe, although this format would be to busy for a journalist to shift through, it could be appreciated by Millman’s target audience of customers. Thanks McKenzie, I think it has potential for alternate uses too.